Choosing the best playing cards, not as straight forward as you may think. If it’s been a while since you last shopped for playing cards, you might be surprised at how many different choices are available. 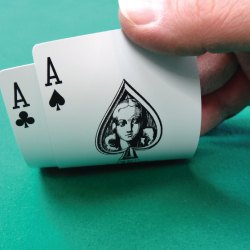 There are several things to keep in mind when selecting the best playing cards for your use. Playing cards are available in different materials, sizes and different font sizes. Playing cards are available in several different materials, such as Card Stock, Plastic Coated, 100% Plastic and Acetate Plastic. Poker Size refers to the width of the playing card. The standard is 2.5 inches which is also called Poker Size or wide size. If you plan to play games like Poker, Baccarat or Black Jack, Poker Size playing cards are a great choice. Bridge Size cards are also available. These cards are 2.25 inches in width. The rule of thumb states that playing card games which require you to handle several cards should be played with Bridge Size, also called narrow size playing cards. If you plan to play games like Bridge, Rummy, Canasta or Hearts then Bridge Size playing cards might be a good choice. Playing Cards are identified by ranks and suits which are printed on to the face of the playing cards. Jumbo Index or Jumbo font refers to the size of the font on the cards. Playing cards are typically available in two or three different index sizes, such as Standard, Jumbo and Magnum indexes. Standard Index is the more traditional size font. Jumbo and sometimes even Magnum index are available from some manufacturers. Magnum index or low vision index are great for people who have vision impairments. Most playing card manufactures will offer customers a wide assortment of cards in different sizes, font sizes, designs and different materials. For example, Bicycle Playing Cards manufactured by The United States Playing Card Company manufacture hundreds of playing cards. In 1885, the most popular brand of standard playing cards was created. The Bicycle Rider Back Standard has been a staple in the playing card world. If you have ever played with cards, chances are you have used a deck of Bicycle Rider Back. Since 1885 The United States Playing Card Company has expanded its line of playing cards to include such popular brands like Kem cards, WPT, WSOP, Prestige, Bee and several others. Some other top manufactures of playing cards include, Copag (Brazil), Modiano (Italy) and Gemaco (USA). All of these manufactures make both plastic and plastic coated cards in several back designs and index sizes. Need help selecting the best cards for your particular use? Visit Straight Poker Supplies or call 1-877-765-3790. Since 2005 Straight Poker Supplies has been the leading distributor of top brand playing cards in Canada. Their selection of cards available and knowledgeable staff can help you narrow down your options and assist you by purchasing the best playing cards.